This is “National Income and the Balance of Payments Accounts”, chapter 2 from the book Policy and Theory of International Finance (v. 1.0). For details on it (including licensing), click here. The most important macroeconomic variable tracked by economists and the media is the gross domestic product (GDP). Whether it ought to be so important is another matter that is discussed in this chapter. But before that evaluation can occur, the GDP must be defined and interpreted. This chapter presents the national income identity, which defines the GDP. It also presents several other important national accounts, including the balance of payments, the twin-deficit identity, and the international investment position. These are the variables of prime concern in an international finance course. Identify the components of GDP defined in the national income identity. Understand why imports are subtracted in the national income identity. GDP = C + I + G + EX − IM. Personal consumption expenditures (C), or “consumption” for short, include goods and services purchased by domestic residents. These are further subdivided into durable goods, commodities that can be stored and that have an average life of at least three years; nondurable goods, all other commodities that can be stored; and services, commodities that cannot be stored and are consumed at the place and time of purchase. Consumption also includes foreign goods and services purchased by domestic households. Private domestic investment (I), or “investment” for short, includes expenditures by businesses on fixed investment and any changes in business inventories. Fixed investment, both residential and nonresidential, consists of expenditures on commodities that will be used in a production process for more than one year. It covers all investment by private businesses and by nonprofit institutions, regardless of whether the investment is owned by domestic residents or not. Nonresidential investment includes new construction, business purchases of new machinery, equipment, furniture, and vehicles from other domestic firms and from the rest of the world. Residential investment consists of private structures, improvements to existing units, and mobile homes. Note that this term does not include financial investments made by individuals or businesses. For example, one purchase of stock as an “investment” is not counted here. Government expenditures include purchases of goods, services, and structures from domestic firms and from the rest of the world by federal, state, and local government. This category includes compensation paid to government employees, tuition payments for higher education, and charges for medical care. Transfer payments, such as social insurance payments, government medical insurance payments, subsidies, and government aid are not included as a part of government expenditures. Exports consist of goods and services that are sold to nonresidents. Imports include goods and services purchased from the rest of the world. The difference between exports and imports (EX − IM) is often referred to as net exports. Receipts and payments of factor income and transfer payments to the rest of the world (net) are excluded from net exports. Including these terms changes the trade balance definition and reclassifies national output as growth national product (GNP). It is important to emphasize why imports are subtracted in the national income identity because it can lead to serious misinterpretations. First, one might infer (incorrectly) from the identity that imports are subtracted because they represent a cost to the economy. This argument often arises because of the typical political emphasis on jobs or employment. Thus higher imports imply that goods that might have been produced at home are now being produced abroad. This could represent an opportunity cost to the economy and justify subtracting imports in the identity. However, this argument is wrong. The second misinterpretation that sometimes arises is to use the identity to suggest a relationship between imports and GDP growth. Thus it is common for economists to report that GDP grew at a slower than expected rate last quarter because imports rose faster than expected. The identity suggests this relationship because, obviously, if imports rise, GDP falls. However, this interpretation is also wrong. The actual reason why imports are subtracted in the national income identity is because imports appear in the identity as hidden elements in consumption, investment, government, and exports. Thus imports must be subtracted to assure that only domestically produced goods are being counted. Consider the following details. When consumption expenditures, investment expenditures, government expenditures, and exports are measured, they are measured without accounting for where the purchased goods were actually made. Thus consumption expenditures (C) measures domestic expenditures on both domestically produced and foreign-produced goods. For example, if a U.S. resident buys a television imported from Korea, that purchase would be included in domestic consumption expenditures. Likewise, if a business purchases a microscope made in Germany, that purchase would be included in domestic investment. When the government buys foreign goods abroad to provide supplies for its foreign embassies, those purchases are included in government expenditures. Finally, if an intermediate product is imported, used to produce another good, and then exported, the value of the original imports will be included in the value of domestic exports. IM = CF + IF + GF + EXF. and indicates that GDP does not depend on imports at all. The reason imports are subtracted in the standard national income identity is because they have already been included as part of consumption, investment, government spending, and exports. If imports were not subtracted, GDP would be overstated. Because of the way the variables are measured, the national income identity is written such that imports are added and then subtracted again. This exercise should also clarify why the previously described misinterpretations were indeed wrong. Since imports do not affect the value of GDP in the first place, they cannot represent an opportunity cost, nor do they directly or necessarily influence the size of GDP growth. GDP can be decomposed into consumption expenditures, investment expenditures, government expenditures, and exports of goods and services minus imports of goods and services. Investment in GDP identity measures physical investment, not financial investment. Government includes all levels of government and only expenditures on goods and services. Transfer payments are not included in the government term in the national income identity. Imports are subtracted in the national income identity because imported items are already measured as a part of consumption, investment and government expenditures, and as a component of exports. This means that imports have no direct impact on the level of GDP. The national income identity does not imply that rising imports cause falling GDP. A measure of the value of all capital equipment and services purchased during a year. The term for the goods and services sold to residents of foreign countries. The component of GDP that includes household purchases of durable goods, nondurable goods, and services. The component of GDP that includes purchases by businesses for physical capital equipment used in the production process. The government spending in the GDP identity does not count these types of government expenditures. Of true or false, imported goods and services are counted once in the C, I, G, or EX terms of the GDP identity. The national income identity says that gross domestic product is given by consumption expenditures, plus investment expenditures, plus government expenditures, plus exports, minus imports. In short, this is written as GDP = C + I + G + EX − IM. Consider each of the following expenditures below. Indicate in which category or categories (C, I, G, EX, or IM) the item would be accounted for in the United States. What is the gross domestic product in a country whose goods and services balance is a $300 billion deficit, consumption is $900 billion, investment is $300 billion, and government spending is $500 billion? Below are the economic data for the fictional country of Sandia. Write out the national income identity. Verify whether Sandia’s data satisfy the identity. Learn how individual transactions between a foreign and domestic resident are recorded on the balance of payments accounts. Learn the interrelationship between a country’s current account balance and its financial account balance and how to interpret current account deficits and surpluses in terms of the associated financial flows. In this section, we demonstrate how international transactions are recorded on the balance of payment accounts. The balance of payments accounts can be presented in ledger form with two columns. One column is used to record credit entries. The second column is used to record debit entries. Almost every transaction involves an exchange between two individuals of two items believed to be of equal value.An exception is the case of unilateral transfers. These transfers include pension payments to domestic citizens living abroad, foreign aid, remittances, and other types of currency transfers that do not include an item on the reverse side being traded. Thus if one person exchanges $20 for a baseball bat with another person, then the two items of equal value are the $20 of currency and the baseball bat. The debit and credit columns in the ledger are used to record each side of every transaction. This means that every transaction must result in a credit and debit entry of equal value. Any time an item (good, service, or asset) is exported from a country, the value of that item is recorded as a credit entry on the balance of payments. Any time an item is imported into a country, the value of that item is recorded as a debit entry on the balance of payments. In the following examples, we will consider entries on the U.S. balance of payments accounts. Since it is a U.S. account, the values of all entries are denominated in U.S. dollars. Note that each transaction between a U.S. resident and a foreign resident would result in an entry on both the domestic and the foreign balance of payments accounts, but we will look at only one country’s accounts. Finally, we will classify entries in the balance of payments accounts into one of the two major subaccounts, the current account or the financial account. Any time an item in a transaction is a good or a service, the value of that item will be recorded in the current account. Any time an item in a transaction is an asset, the value of that item will be recorded in the financial account. Note that in June 1999, what was previously called the “capital account” was renamed the “financial account” in the U.S. balance of payments. A capital account stills exists but now includes only exchanges in nonproduced, nonfinancial assets. This category is very small, including such items as debt forgiveness and transfers by migrants. However, for some time, it will be common for individuals to use the term “capital account” to refer to the present “financial account.” So be warned. Consider two individuals, one a resident of the United States, the other a resident of Japan. We will follow them through a series of hypothetical transactions and look at how each of these transactions would be recorded on the balance of payments. The exercise will provide insight into the relationship between the current account and the financial account and give us a mechanism for interpreting trade deficits and surpluses. Step 1: We begin by assuming that each individual wishes to purchase something in the other country. The U.S. resident wants to buy something in Japan and thus needs Japanese currency (yen) to make the purchase. The Japanese resident wants to buy something in the United States and thus needs U.S. currency (dollars) to make the purchase. Therefore, the first step in the story must involve an exchange of currencies. The transaction involves an exchange of currency for currency. Since currency is an asset, both sides of the transaction are recorded on the financial account. The currency exported is $1,000 in U.S. currency. Hence, we have made a credit entry in the financial account in the table below. What matters is not whether the item leaves the country, but that the ownership changes from a U.S. resident to a foreign resident. The currency imported into the country is the ¥112,000. We record this as a debit entry on the financial account and value it at the current exchange value, which is $1,000 as noted in the table. Step 2: Next, let’s assume that the U.S. resident uses his ¥112,000 to purchase a camera from a store in Japan and then brings it back to the United States. Since the transaction is between the U.S. resident and the Japanese store owner, it is an international transaction and must be recorded on the balance of payments. The item exported in this case is the Japanese currency. We’ll assume that there has been no change in the exchange rate and thus the currency is still valued at $1,000. This is recorded as a credit entry on the financial account and labeled “¥ currency” in the table below. The item being imported into the United States is a camera. Since a camera is a merchandise good and is valued at ¥112,000 = $1,000, the import is recorded as a debit entry on the current account in the table below. We can construct summary statistics for the entries that have occurred so far by summing the debit and credit entries in each account and eliminating double entries. In the following table, we show all the transactions that have been recorded. The sum of credits in the current account is the $1,000 computer. The sum of debits in the current account is the $1,000 camera. On the financial account there are two credit entries of $1,000, one representing U.S. currency and the other representing Japanese currency. There are two identical entries on the debit side. Since there is a U.S. currency debit and credit entry of equal value, this means that the net flow of currency is zero. The dollars that left the country came back in subsequent transactions. The same is true for Japanese currency. When reporting the summary statistics, the dollar and yen currency financial account entries would cancel, leaving a net export of assets equal to zero and the net inflow of assets equal to zero as well. After cancellations, then, the summary balance of payments statistics would look as in the following table. The current account balance is found by summing the credit and debit entries representing exports and imports, respectively. This corresponds to the difference between exports and imports of goods and services. In this example, the current account (or trade) balance is CA = $1,000 − $1,000 = 0. This means the trade account is balanced—exports equal imports. The financial account balance is also found by summing the credit and debit entries. Since both entries are zero, the financial account balance is also zero. Step 3b: Step 3b is meant to substitute for step 3a. In this case, we imagine that the Japanese resident decided to do something other than purchase a computer with the previously acquired $1,000. Instead, let’s suppose that the Japanese resident decides to save his money by investing in a U.S. savings bond. In this case, $1,000 is paid to the U.S. government in return for a U.S. savings bond certificate (an IOU) that specifies the terms of the agreement (i.e., the period of the loan, interest rate, etc.). The transaction is recorded on the financial account as a credit entry of $1,000 representing the savings bond that is exported from the country and a debit entry of $1,000 of U.S. currency that is imported back into the country. We can construct summary statistics assuming that steps 1, 2, and 3b have taken place. This is shown in the following table. The sum of credits in the current account in this case is zero since there are no exports of goods or services. The sum of debits in the current account is the $1,000 camera. On the financial account, there are three credit entries of $1,000: one representing U.S. currency, the other representing Japanese currency, and the third representing the U.S. savings bond. There are two $1,000 entries on the debit side: one representing U.S. currency and the other representing Japanese currency. Again, the dollar and yen currency financial account entries would cancel, leaving only a net export of assets equal to the $1,000 savings bond. The net inflow of assets is equal to zero. After cancellations, the summary balance of payments statistics would look like the following table. The current account balance is found by summing the credit and debit entries representing exports and imports, respectively. This corresponds to the difference between exports and imports of goods and services. In this example, the current account (or trade) balance is CA = $0 − $1,000 = −$1,000. This means there is a trade deficit of $1,000. Imports of goods and services exceed exports of goods and services. The financial account balance is also found by summing the credit and debit entries. In this example, the financial account balance is KA = $1,000 − $0 = +$1,000. This means the financial account has a surplus of $1,000. Exports of assets exceed imports of assets. current account balance + financial account balance = 0. In the first set of summary statistics (1, 2, 3a), both the current account and the financial account had a balance of zero. In the second example (1, 2, 3b), the current account had a deficit of $1,000 while the financial account had a surplus of $1,000. This implies that anytime a country has a current account deficit, it must have a financial account surplus of equal value. When a country has a current account surplus, it must have a financial account deficit of equal value. And when a country has balanced trade (a balanced current account), then it must have balance on its financial account. It is worth emphasizing that this relationship is not an economic theory. An economic theory could be right or it could be wrong. This relationship is an accounting identity. (That’s why an identity symbol rather than an equal sign is typically used in the formula above.) An accounting identity is true by definition. Of course, the identity is valid only if we use the true (or actual) current account and financial account balances. What countries report as their trade statistics are only the measured values for these trade balances, not necessarily the true values. Statisticians and accountants attempt to measure international transactions as accurately as possible. Their objective is to record the true values or to measure trade and financial flows as accurately as possible. However, a quick look at any country’s balance of payments statistics reveals that the balance on the current account plus the balance on the financial account rarely, if ever, sums to zero. The reason is not that the identity is wrong but rather that not all the international transactions on the balance of payments are accounted for properly. Measurement errors are common. current account balance + financial account balance + statistical discrepancy = 0. The second lesson from this example is that imbalances (deficits and surpluses) on the balance of payments accounts arise as a result of a series of mutually voluntary transactions in which equally valued items are traded for each other. This is an important point because it is often incorrectly interpreted that a trade deficit implies that unfair trade is taking place. After all, the logic goes, when imports exceed exports, foreigners are not buying as many of our goods as we are buying of theirs. That’s unequal exchange and that’s unfair. The story and logic are partially correct but incomplete. The logic of the argument focuses exclusively on trade in goods and services but ignores trade in assets. Thus it is true that when imports of goods exceed exports, we are buying more foreign goods and services than foreigners are buying of ours. However, at the same time, a current account deficit implies a financial account surplus. A financial account surplus, in turn, means that foreigners are buying more of our assets than we are buying of theirs. Thus when there is unequal exchange on the trade account, there must be equally opposite unequal exchange on the financial account. In the aggregate, imbalances on a current account, a trade account, or a financial account do not represent unequal exchanges between countries. Every transaction between a domestic and foreign resident can be recorded as a debit and credit entry of equal value on the balance of payments accounts. All components of transactions that involve assets, including currency flows, are recorded on the financial account; all other items are recorded on the current account. All trade deficits on a country’s current account implies an equally sized financial account surplus, while all trade surpluses implies an equally sized financial account deficit. In the aggregate, imbalances on a current account, a trade account, or a financial account do not represent unequal exchanges, or inequities, between countries. The balance on a country’s financial account when its current account has a deficit of $80 billion. A country’s financial account balance when its trade balance is −$60 billion, its service balance is +$25 billion, and its unilateral transfer and income account has a surplus of +$10 billion. The international transactions for shares of stock in corporations (in excess of 10 percent of the company’s value) or for real estate. Of credit or debit, this is how exports are recorded on the balance of payments. Of current account or financial account, this is where an export of a clock will be recorded. Of current account or financial account, this is where an import of currency from your aunt in Paraguay will be recorded. Learn the interrelationship between a country’s government budget balance (deficit) and its current account balance (deficit). Interpret the interrelationships of trade balances and budget balances in terms of the sources and uses of funds in the financial system. One of the important relationships among aggregate economic variables is the so-called twin-deficit identityShows the relationship between a country’s government budget deficit and a country’s current account deficit. It says that the sum of net private saving (Sp − I) and the current account deficit must equal the government budget deficit., a term in reference to a country’s government budget deficit and a simultaneous current account deficit. The name for this identity became commonplace during the 1980s and 1990s because at that time the United States experienced deficits in both of these accounts. Now, as we will see later, the identity will be a misnomer in many circumstances since there is no reason that “twin” deficits need to always appear together on these two national accounts. In fact, some countries will, at times, experience a deficit on one account and a surplus on the other. Also, at times, a country will experience a surplus on both accounts. Thus a better title to this section would be “The Relationship between a Country’s Government Budget Deficit and Its Current Account Deficit.” However, since 2004, the United States finds itself back in the twin-deficit scenario, and since “twin-deficit identity” rolls off the tongue much more easily, we will stick to this title. To understand this identity it will be helpful to take a much more careful look at the national income identity. This time I will build up the identity in a stepwise fashion using a circular flow diagram to better visualize the flows of money within an economy. A circular flow diagram is typically one of the first principles shown to students in an introductory macroeconomics class. Its purpose is to show the flow of money between the major players (or agents) within an economy. Circular flow diagrams can be either simple or complex depending on how many agents one introduces into the system and how finely one wishes to break down the monetary flows. 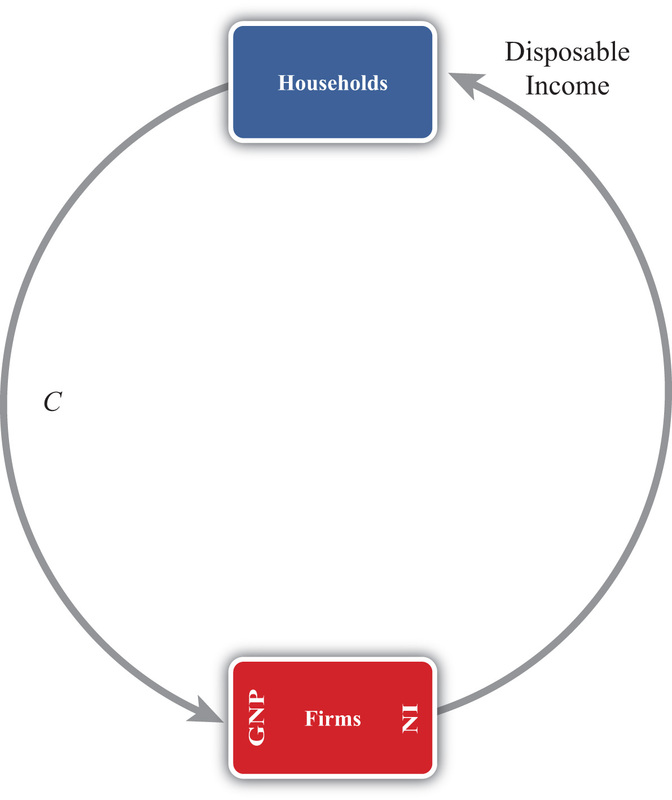 The simplest version of a circular flow diagram considers an economy consisting of two agents: households and firms. We imagine that firms produce goods and services using labor as an input. The flow of money is shown in Figure 2.2 "The Simplest Circular Flow". 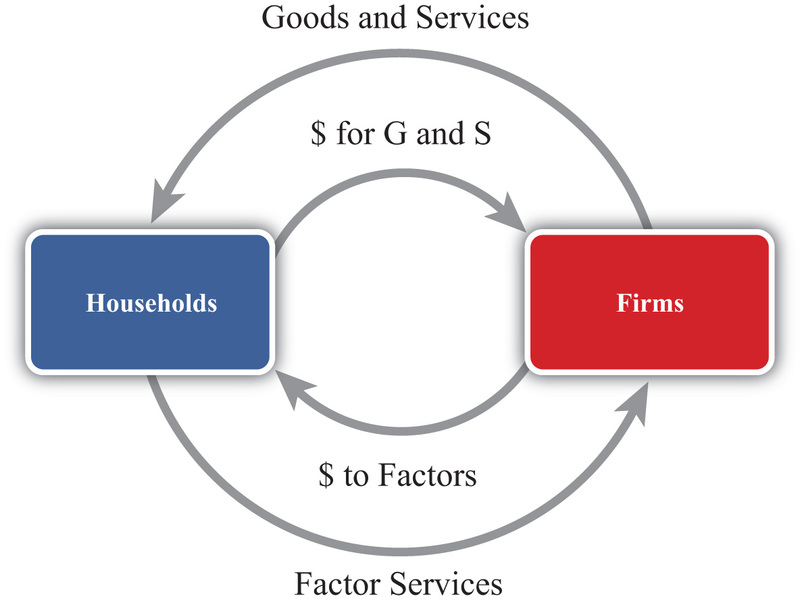 The C arrow represents the dollar value of consumption expenditures made by households to purchase the goods and services produced and sold by firms. (The goods and services flow could be represented by an arrow in the opposite direction to C, but we leave that out for simplicity.) Since we assume in this case that there are only households buying goods, all GNP consists of C. The money that flows to firms from sales of consumption goods is given to the workers in exchange for their labor services. This monetary flow is represented by the arrow labeled “disposable income.” Disposable income is all the money households have to spend, which in this case is equal to the national income (NI). Note especially that we use GNP rather than GDP as our measure of national income so that flows with the rest of the world later are properly defined. The circular flow can be extended one step by adding financial institutions in Figure 2.3 "The Circular Flow Adding Financial Institutions". Financial institutions represent any company that facilitates borrowing and lending; the prime example is a bank. However, they may also include investment companies, pension funds, and mutual funds. The presence of financial institutions allows some money to be diverted from the consumption flow. 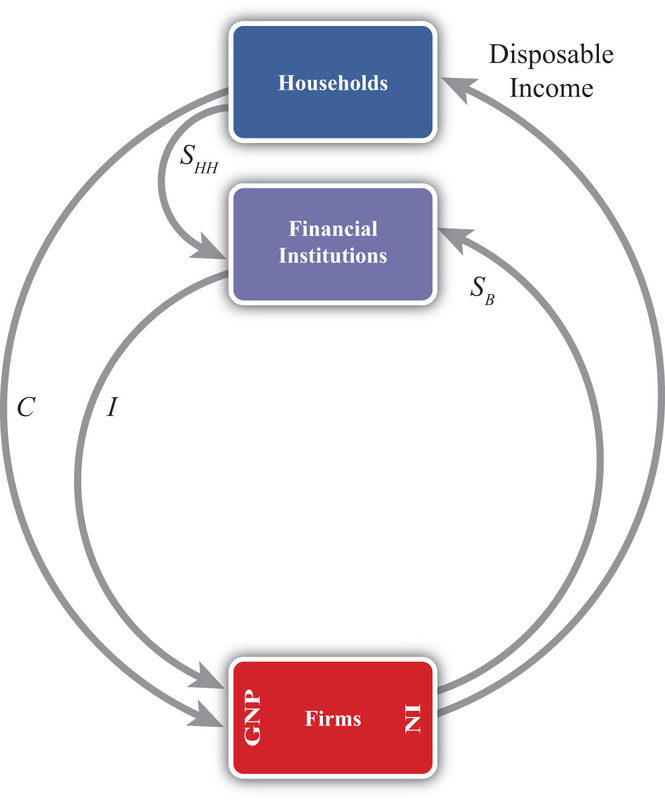 In Figure 2.3 "The Circular Flow Adding Financial Institutions", these diversions are represented by SHH, representing household savings and SB, representing business saving. Some of the revenue earned by firms is not actually given out to workers in the form of wages. Instead some money is “retained” in the form of profit and excess earnings. These retained earnings are generally used to purchase investment goods to help an industry replace worn-out capital equipment and to add new capital. Much of these retained earnings may be used directly to purchase new capital equipment, although some of it will be saved by depositing it in a financial institution. For simplicity we will imagine that all such business saving flows through the financial system, hence the SB arrow. In addition, households generally hold back some of their income from spending and deposit it into pension plans, savings accounts, and so on. Thus we include the arrow from households. The easiest way to think of the diagram is to imagine that financial institutions take deposits from firms and households and then lend out the money to finance investment spending, I. With some exceptions, this is the way it will often work. One notable exception is that some of the money lent by banks is often used to finance consumption rather than investment. This occurs whenever households finance consumption spending using a credit card. However, we can avoid this complication by defining SHH as being “net” savings, where the net means “after subtracting household borrowing.” With this definition in mind, it should be clear that SHH can be negative—that is, its flow reversed—if household borrowing exceeds household saving. We can now identify several important relationships. The first one relates to an important decision made by households. They choose how much of their disposable income should be spent on consumption and how much should be saved. You may recall from previous courses that the fraction of income spent on consumption goods (from an extra dollar of income) is called the marginal propensity to consumeThe additional amount of aggregate consumption that arises from an additional dollar of national income., while the fraction of income saved is called the marginal propensity to save. A second relationship is shown on the left side of the Firms box. This indicates that GNP is equal to the sum of C and I. This version of the national income identity would only be valid if there were no government sector and no trade with the rest of the world. or simply, private saving equals investment. Note that the term “private” is used here to distinguish it from government (or public sector) saving, which we’ll include next. Next, let’s add in the government sector in Figure 2.4 "The Circular Flow Adding Government". The government is shown both to take money out of the circular flow and to inject money back in. Money is withdrawn first in the form of taxes (T). In the adjoining diagram, taxes are represented as a flow of money directly from firms, as if it is entirely a tax on income. This is a simplification since in reality taxes are collected in many forms from many different agents. For example, governments collect profit taxes from firms and financial institutions, sales and property taxes from households, and tariffs on traded goods (not included yet). All of these taxes are assumed to be lumped together in the T flow and withdrawn directly from national income. Tax revenues (TR) can be spent in two separate ways. The TR flow represents transfer payments injected into the household income stream. Transfer payments include social security paid to retired workers, Medicaid and welfare payments, unemployment, and so on. These are government expenditures that do not exchange for a particular good or service. The second type of expenditure is G. G represents spending by government for the purchase of goods and services produced by firms. It includes defense spending, education, police and fire protection, and so on. The final monetary flow, shown flowing out of the government, is labeled SG and refers to government saving. It should be obvious that the money collected by government in the form of taxes need not always equal government expenditures. In the event that tax revenues exceed expenditures, the government would have extra money left over. We imagine that this money would be saved in the financial sector since it is always better to collect interest when possible. Hence we draw the flow of excess funds, government saving (SG), flowing from government into the financial sector. SG = T − TR − G.
When T exceeds the sum of TR and G, the government has extra saving that flows into the financial sector. These funds would then be available to lend out and finance additional investment. Of course, what is more typical of many governments is for the sum of TR and G to exceed tax revenue, T. In this case, the flow of government saving (SG) would be negative and would be represented in the diagram as a flow in the opposite direction. In this case, the government would be borrowing money from the financial sector to finance its excess expenditures. We would also say that the government is running a budget deficit. In short, negative government saving, that is, SG < 0, implies a government budget deficit, which the government finances by borrowing from the financial sector. Otherwise, positive government saving, that is, SG > 0, implies a government budget surplus, which results either in additions to saving or a repayment of previous debt. 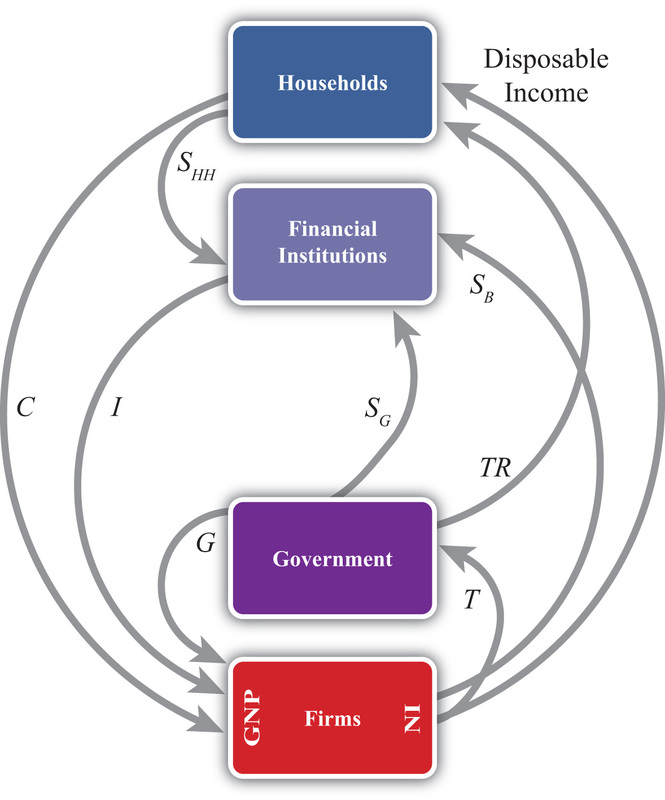 Next, in this version of the circular flow, we can represent the national income identity as the flow of money into firms. In this case, GNP equals the sum of C, I, and G. This version would only be Accurate when there is no trade with the rest of the world. SHH + SB + SG = I. This identity says that the sum of household, business, and government saving must equal private investment expenditures. 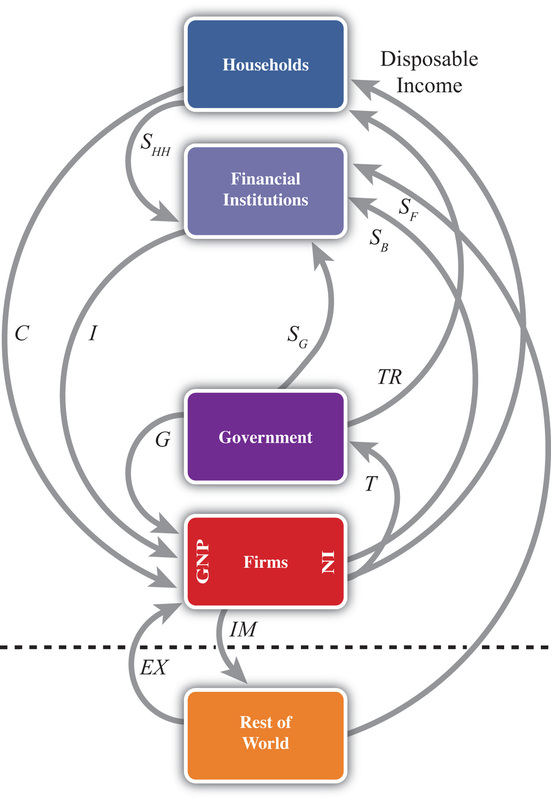 which is represented by the flow of money into (and away from) firms on the left side of the diagram. However, as noted elsewhere, EX − IM, the balance on the current account, need not be equal to zero. If EX − IM > 0, then the country would have a current account (CA) surplus, whereas if EX − IM < 0 the country would have a CA deficit. Consider when EX − IM < 0. In this case, more money flows out to purchase imports than flows back in to purchase exports. Essentially, there is a loss of money to the RoW despite some exceptions; however, this money does not remain outside the country. Instead, it is brought right back in and deposited into financial institutions (shown as the SF flow on the diagram). In other words, it is saved. This saving represents the country’s financial account surplus, which is equal and opposite to the CA deficit (see Chapter 2 "National Income and the Balance of Payments Accounts", Section 2.5 "Recording Transactions on the Balance of Payments" for a more complete explanation). SF = IM − EX. This says that foreign saving equals the CA deficit. From the perspective of the foreigners, we would refer to SF as money saved or lent to the domestic country. From the perspective of the domestic country, SF would be considered money borrowed from the RoW. Clearly, since a country may run a surplus on trade (i.e., EX − IM > 0), SF could also be negative. In this case, the RoW would either be dissaving, meaning it is withdrawing previously accumulated saving from the domestic country, or the RoW would be borrowing money from the domestic country. This would occur if a domestic bank makes a loan to someone abroad. Alternatively, from the perspective of the domestic country, we can say it is lending money to the RoW when SF < 0. SHH + SB + SG + SF = I.
SP + SG + SF = I. The identity is best interpreted by noting that there are four key sources for funds in the financial sector that are not part of the consumption stream. The pool of funds to finance investment can be drawn from households, businesses, the government, or from the RoW. Also, the sum of all funds not used for consumption must be equal to the amount spent on investment goods. It is important to note that this relationship is an accounting identity. This means that the relationship must be true as long as all variables are measured properly. This is not an economic theory, which is a proposition that may or may not be true. In practice, this identity rarely adds up, however, because the variables are not typically measured accurately. SP = SHH + SB. SP + T − TR − G + IM − EX = I. (SP − I) + (IM − EX) = (G + TR − T). (SP − I) = (G + TR − T) − (IM − EX). Perhaps the best way to get a feel for the twin-deficit relationship in a country is to look at the numbers. Table 2.7 "U.S. Twin-Deficit Figures (GDP), 1997–2008" and Table 2.8 "China Twin-Deficit Figures (GDP), 1997–2007" show values for the twin-deficit identity in the United States and in China over the past ten years or so. All values are presented as a percentage of GDP. Also, because the data on the balance of payments never add up, which results in a statistical discrepancy term, the twin-deficit identity numbers do not add up. To avoid that problem, the private saving numbers presented are not the actual reported values but the values saving would have to be to assure the twin-deficit identity adds up—that is, it is derived as a residual value. * Private saving is calculated as a residual. Source: U.S. Bureau of Economic Analysis, National Economic Accounts, Frequently Requested NIPA Tables. See U.S. BEA interactive tables for the years indicated at http://www.bea.gov/national/nipaweb/SelectTable.asp?Popular=Y. Source: China Data Online, China Statistical Yearbook. See China Statistical Yearbooks located at http://chinadataonline.org/member/yearbooksp/default.asp?StartYear=1981&EndYear=2009&IFFirst=yes&page=2. The twin-deficit numbers reveal some interesting patterns. As of the most recent data (2008), the United States has twin deficits, with a CA deficit of 4.7 percent of GDP and a government budget deficit of 4.2 percent. Since these numbers are almost equal, it is as if the U.S. government deficit, which must be financed with borrowing, is being financed by borrowed funds from abroad. In the previous year, 2007, government borrowing requirements were much lower, at 1.6 percent, but borrowing from foreigners was higher at 5.3 percent. The extra borrowing allowed the U.S. savings rate to remain much lower than the private investment requirement. We can interpret this year as one in which private investment was mostly financed with borrowings from abroad. The United States has had twin deficits since 2001, when it finished a four-year run with a trade deficit and a government budget surplus. This demonstrates that twin “deficits” do not always arise despite the label used to describe the identity. During the budget surplus years the government was able to retire some of its outstanding debt, but the country also ran CA deficits implying, essentially, borrowings from foreigners. As in 2007, these years also describe periods in which foreign borrowings are used to maintain a higher investment level than can be sustained with the lower national savings rate. In contrast, consider the twin-deficit numbers calculated in the same way for China during the same period. The differences with the U.S. numbers are striking. The two things that stand out immediately are the significantly higher values for private saving and investment. Instead of numbers in the midteens in the United States, China’s percentages are in the midforties to low fifties. Again, the savings terms are calculated as residuals, so there may be some error there, but nonetheless it is clear that China both saves and invests about three times more than the United States as a percentage of GDP. Because it invests so much more, the implication from the national income identity is that China consumes much less than the United States as a percentage. Indeed, China’s consumption figures (not shown) are usually less than 50 percent of GDP. Indeed, this is why China and many other Asian economies are described as high-saving and low-consuming countries. The United States in comparison is described as a high-consumption country and low-saving country. The negative number on China’s CA deficit in all the years means that China has run a trade surplus. A surplus means it is lending money abroad and forgoing consumption, by another 11 percent in 2007. (This will be explained in more detail in Chapter 3 "The Whole Truth about Trade Imbalances".) Also, the negative number for China’s budget balance means that it was running a government budget surplus in 2007. So in 2007, China had twin surpluses—a much rarer occurrence—rather than twin deficits. In previous years China didn’t have twin anything: running trade surpluses that were increasing through the past decade, and government budget deficits. It is worth reflecting briefly on the large investment and trade surpluses in China in comparison with the United States. The U.S. per capita GDP is about $47,000. Comprising that per person production is about 15 percent that goes into investment. That still leaves a considerable percentage left for the consumption and government spending that enhance Americans’ standard of living. In contrast, China’s per capita GDP, in purchasing power parity (PPP) terms, is about $6,000. Per person, it produces much less than in the United States. But curiously, despite being a much poorer country, the high investment rate means that it consumes and spends on government programs a much smaller percentage of its income than the United States; perhaps as little as $3,000 per person. This seems to fly in the face of simple logic. One might expect that a richer country like the United States would save more and consume less since it can do so while still maintaining a high standard of living. For a poorer country like China, we might expect it would save less and try to consume a larger proportion of its income in order to catch up (i.e., in terms of its standard of living) with the rest of the world. Instead, it is the exact opposite. Twin deficits occur when a country has both a current account deficit and a government budget deficit at the same time. When twin deficits occur, the sum of net private saving (Sp − I) and the current account deficit must equal the government budget deficit. A government budget deficit represents a use of funds drawn from the financial sector. A trade deficit represents a source of funds for the financial sector. Private saving represents a source of funds for the financial sector. Private investment represents a use of funds drawn from the financial sector. The United States has run twin deficits for the past seven years. It can be reasonably described as a low-investment, low-saving, and high-consumption country. China has mostly run trade surpluses and budget deficits in the past decade. It can be reasonably described as a high-investment, high-saving, and low-consumption country. An excess of government receipts over expenditures. National income minus taxes plus transfer payments. The level of government spending when the government deficit is $100 billion, transfer payments are $800 billion, and tax revenues are $1,300 billion. The four different sources of saving described in this chapter. Of deficit, surplus, or balance, the balance on the current account if the expression IM − EX in the twin-deficit identity is positive. Of deficit, surplus, or balance, the balance on the government budget if the expression (G + TR − T) in the twin-deficit identity is positive. What is the government’s budget balance if government spending is $40 billion, private saving is $60 billion, government transfer payments are $10 billion, private investment is $80 billion, and tax revenues are $50 billion? Show your work. Below are the economic data for the fictional country of Sandia. Write out the twin-deficit identity. Verify whether Sandia’s data satisfy the identity. Explain what also would have to hold for there to be a direct relationship between budget deficit changes and trade deficit changes. Is it possible to account for a reduction in the federal government budget deficit and a simultaneous increase in the current account deficit? Explain. Is it possible to reduce the federal government budget deficit, maintain the same level of net private saving (i.e., Sp − I), and still experience an increase in the current account deficit? Explain. Explain whether the following economic changes are consistent with the twin-deficit identity. Assume ceteris paribus, meaning all other variables in the identity remain fixed. A $10 billion increase in the government budget deficit and a $10 billion increase in the current account deficit. A $50 billion decrease in the government budget deficit and a $50 billion increase in private investment. A $10 billion increase each in the government budget surplus, the current account deficit, private saving, and private investment. A $30 billion increase in the current account surplus and a $30 billion increase in the government budget deficit. Use the twin-deficit identity to fill in the blank values in the table below for the three fictitious countries. Which country is best described as financing its government budget deficit with domestic saving? Which country is best described as financing its government budget deficit with foreign saving? Which country is best described as financing extra domestic investment with government saving?